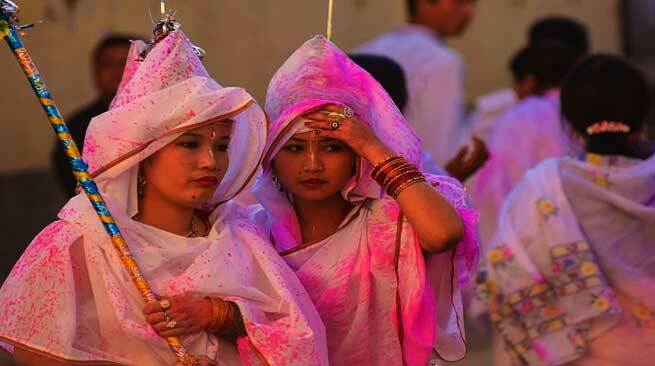 Five-day Yaoshang Festival began from Wednesday in Manipur. Festival is the mixture of traditional festival with Holi. Yaoshang is one of the premier festivals of Manipur, celebrated on the full moon day of Phalguna and is one of the major festivals of this North eastern state. A small hut constructed for the festival at every locality was set fire after worshipping Lord Gouranga Mahaprabhu in the evening yesterday. After the ceremony, small kids visited every houses and begged money and continued the next morning. It is called ‘Nakathengba’. Today is Holi celebration at the Govindaji Temple at the Royal Palace in Imphal. Holi Pala(singers) from different regions will throng at the Govindaji Mandop and sing the Holi songs. Colours from Pichakari will spray on the yellowish dresses of the performers. Girls will forcibly take money from the menfolk and boys will apply Aber (colour powder) on the face of girls on the roads during the festival. Main highlight of the festival is the Thabal Chongba dance. Thabal Chongba is a Manipuri folk dance where boys and girls form a circle and hold hands and sing and dance. Thabal Chongba, the community dance will be organized at every locality in the evening till midnight where the boys from other localities will dance with the local girls during the festival. Newspapers will stop publication during the festival. Sports festivals are organized in every locality now a day to divert the odds of the festival. Yaoshang is one of the biggest festival which bring love and harmony amongst the human beings. Donations are collected from house to house and the money collected is spent on parties and merry making. So if you are planning a trip to Manipur in the month of February, don’t forget to be a part of the Yaoshang festival and carry home the memories you will cherish all your lives.